Launch day is finally here! I’ve been working very hard to create a brand new About Catholics experience for you for many years and I am proud to offer this website to you today. The old website was creaking along on custom-built software that was several years old. Today we transition to a state of the art content management system which will make updating the site much easier. The screenshot below shows some of the significant changes for the overall look and feel of the website. The site was recreated and reorganized to be more action-oriented with the navigation focused on four specific areas. “Learn” is where all of the topics on specific Catholic beliefs are contained. These articles are now tagged with the relevant Catholic topic like purgatory or sexuality. You can now comment directly on the articles on the website. “Pray” has many different Catholic prayers and also personal reflections from various authors. My hope is that this website inspires you to pray to God, deepening your relationship with him. “Discuss” is formerly the Community Forums. It’s another way beside the comments sections on each article for About Catholics visitors to interact with each other and share Catholic experiences and ask questions about the Catholic faith. Today also marks the launch of the About Catholics Blog. It will contain reflections and commentary on current events from a Catholic perspective. I will have book reviews and comment on items in the news. I hope it stimulates discussion about the particular topics and that you enjoy it. 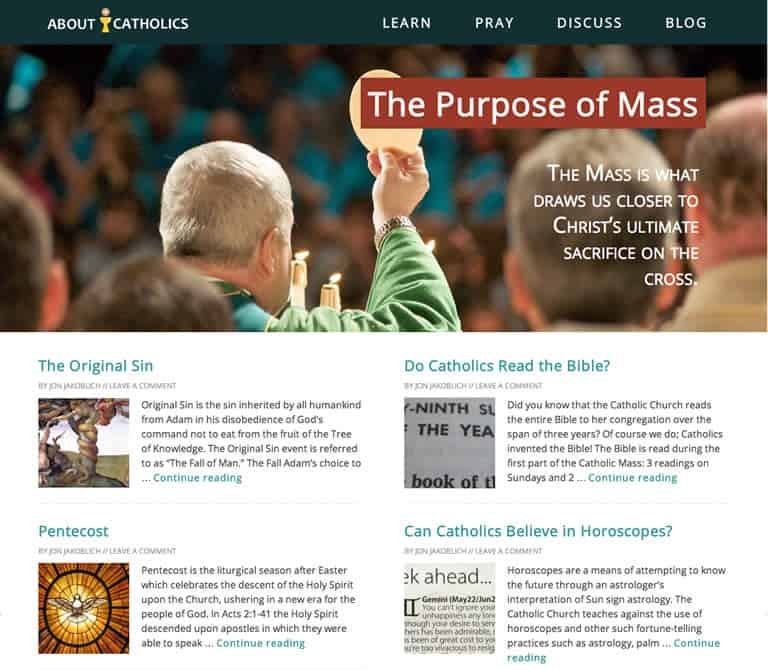 AboutCatholics.com is now a mobile friendly website. The pages dynamically resize and shift based upon the type of device you are using to create the best possible experience. I will continue to work on the site to continue our mission of evangelization and to improve the experience. Thank you for visiting the site and for reading about the changes. I hope you like them. Please leave your comments below. I look forward to your feedback! Great work, great graphics, and newer content.